Hi Frugalistas! 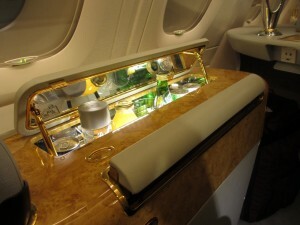 Regular readers will no doubt recall my review of the Emirates A380 First Class Suite last year. 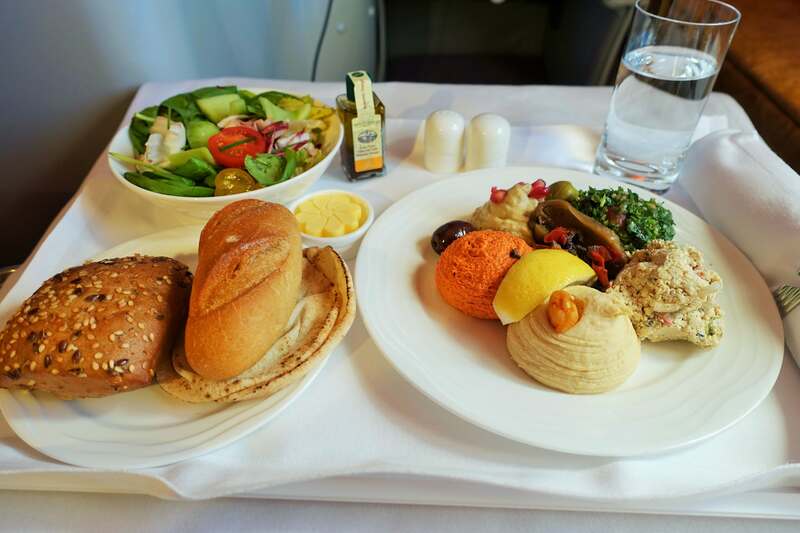 It was very, very good, but in my comparison with Etihad Diamond First Class, I had to give it to Etihad. 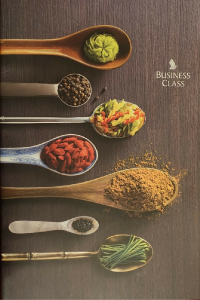 I’ve travelled numerous times on the Etihad Pearl Business Class, so was curious see what Emirates had to offer in Business Class. I was also interested in exploring the wonderful A380 aircraft further – even though there was no shower in Business Class. 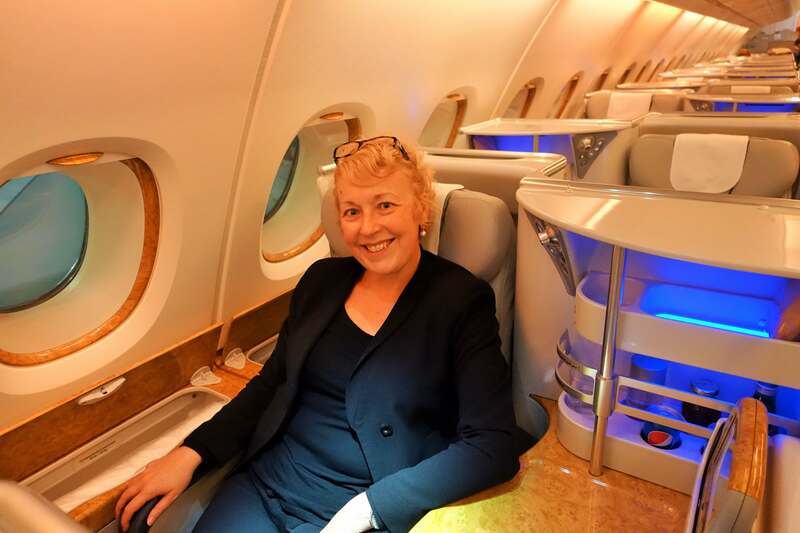 Travelling back from TBEX last month I was fortunate to experience the Emirates A380 Business Class from Dubai to Sydney. 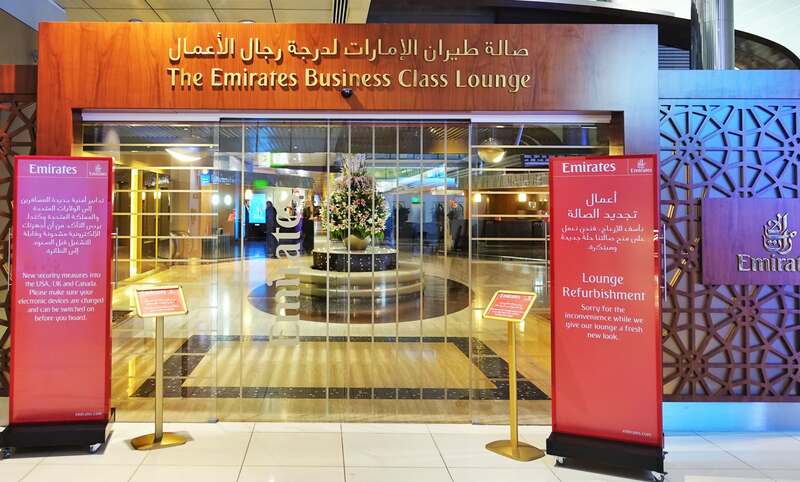 As I’d flown through from Athens on Emirates short haul (more on that in a future post) my first real experience of Emirates in Dubai was the Business Class lounge. Dubai airport is very big, but well sign posted so the lounge is very easily found. When I arrive it is undergoing refurbishment – and to my horror the Spa is closed. Like the Emirates First Class lounge in Dubai the Business Class one overlooks the main shopping concourse, making it quite noisy. It is also very dimly lit for some reason (I’ve brightened the photos I’ve taken so you can see the lounge properly). That, combined with the lack of passengers in it, makes it all look a bit forlorn. I wander down to the dining room, which has a very institutional cafeteria feel, then settle into a comfy chair to take advantage of the free wifi. 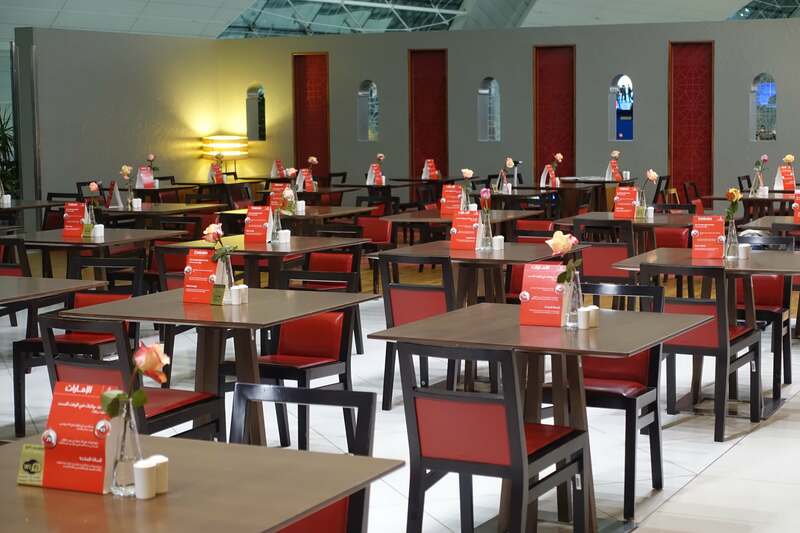 There is plenty of food and choice of drinks, and the staff are very attentive. Given the time of the night and the 14hour flight ahead I stick to some mineral water. Upon boarding the first thing I notice is how vast the Business Class Cabin is. Everyone gets an aisle seat courtesy of the staggered seating arrangement. While the openness of it gives the cabin a lovely light, airy feeling I imagine it could get quite noisy at times. Settling into that really comfy seat – 2am, so yes, I was a little tired! What really impresses me about the Emirates Business Class seat though is just how comfortable it is. I found the First Class Suite seat a bit hard (particularly when in lie flat mode) and uncomfortable, but not this baby. Supremely comfortable for the entire 14 hour trip and easy to adjust to that “just so” position regardless of what you want to do, it’s an absolute winner for me. In sleep mode with the mattress slipped onto it, I slept supremely well without any real effort (my flight was due in at 10.30pm Sydney time so I wasn’t looking for a huge sleep). I’ve slept on less comfortable beds in hotels….. There are no pyjamas in Business Class (but if you recall they are truly dreadful in First Class so I’m not fussed), but the Bulgari amenities kit is a class act. A beautiful satin pouch and full of some lovely goodies, all stored in a linen drawstring bag. It definitely gives the First Class amenities kit a run for its money, and comes home with me for future use. Like in First Class, I found the service to be perfectly respectable, just not terribly personal. Wandering down to the back of the cabin to the much-publicised (by Emirates anyway) Business Class Bar I find the service very underwhelming. Both flight attendants seem more interested in primping and preening the food on display to make it look pretty than to actually serve. During meal services I find the very mechanical tour of the cabin with all the wines and spare glasses like an economy service a bit disappointing. It’s not poor service, just impersonal, and as I said, mechanical…..
Food is served attractively on trays, and courses are brought out one at a time as you would expect. I’m horrified at the end of the meal service though, when I see flight attendants dashing up and down the aisles with trays stacked up one on top of the other. It looks awful. Where the service on this flight does win a big tick for me this time is the setting up of my bed. On the equivalent flight in First Class last year it was all self-service, but this time round I return from the loo to find my mattress and pillow waiting for me after we take off. Now the food. This sounds terribly snobby I know, but I don’t like Veuve Cliquot Champagne which is what they serve in Business Class. Having said that, the rest of the wine list is good, featuring a range of French, Australian and other wines. A French Bordeaux is sensational. A choice of cocktails are also available for those like me who pass on the Veuve. All round, the wine and other drinks on offer is good, and I think you would have to be extremely picky not to find something to your liking. The food itself is good, but dare I say it, very “airline”. Again, others do it better, with a more restaurant style offering. The big exception is the gorgeous meze plate I enjoy as an entrée (appetiser). A very generous serve, appetising plating and fabulous flavors it is definitely “restaurant worthy”. Which makes up for the Arabian chicken and rice main course (entrée) which, while a generous serve is really just chicken and rice with a few spices. I pass on dessert and cheese plates, but see other guests with them, and I must say, they do look good. 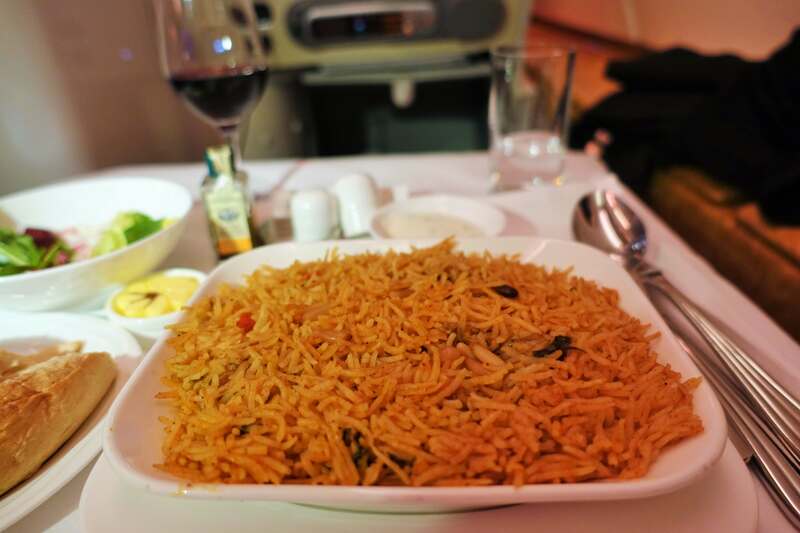 The underwhelming chicken and rice…..
Down in the bar area a number of snacks are available during the flight, along with wines, spirits and mixed drinks. My little bagel and sandwich are very, very fresh (and not overly chilled as you often find) and also very tasty. Apart from my mezes, they are definitely the best food on the plane. Despite my lack of enthusiasm for the service and meals, I do like the Emirates A380 Business Class. The seat is amazingly comfortable with a luxurious amount of storage. The food and service are fine, just not “the best” I’ve experienced. 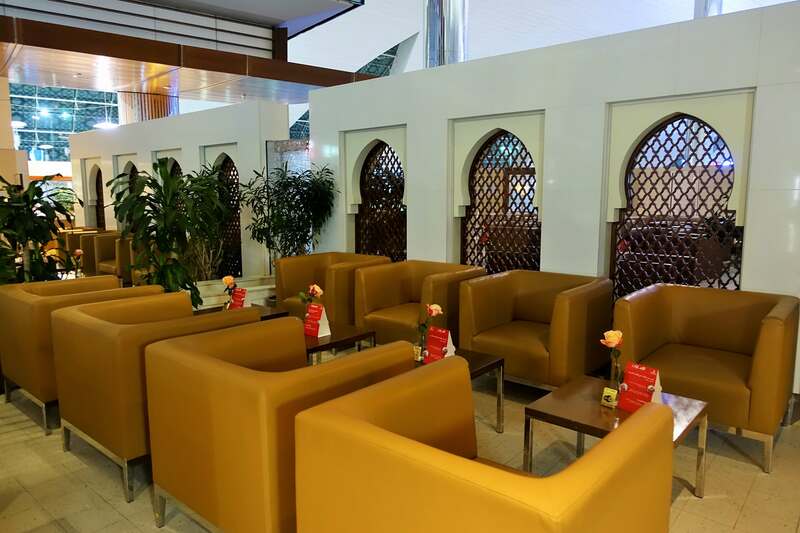 I’ll suspend judgement on the Dubai lounge for the moment while it is refurbished, but the noise from the concourse and the dim lighting was a bit underwhelming. Despite the shower, the caviar and suite, I really don’t know if I would bother with the extra money (or in my case points) to pay for a First Class Suite. The seat is far more comfortable, and you will have more than enough room in Business Class. There is not a discernable difference in service. So really, First Class makes for a very expensive shower, awful pyjamas and glass of Dom Perignon (which to be honest is much more to my liking). 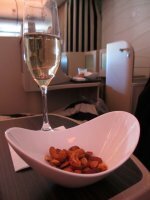 If I’m flying Emirates again, it will be in Business Class – even if I don’t like the champagne! 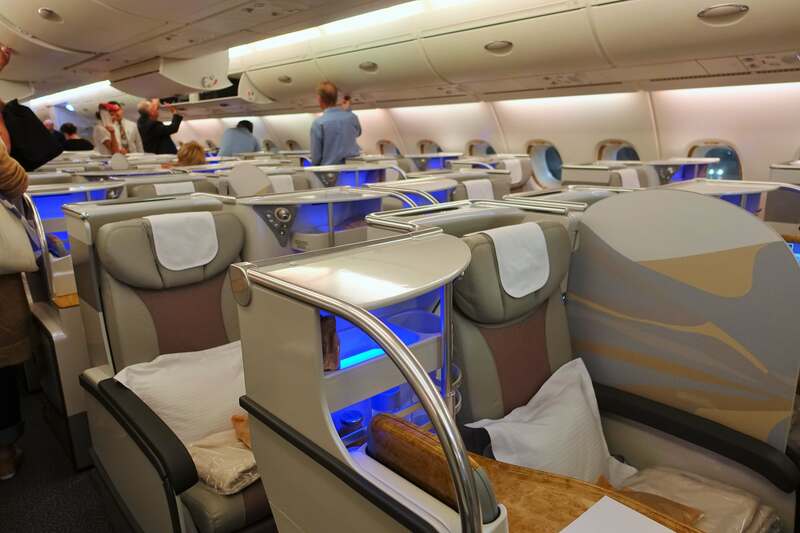 If you can only dream about Business Class you can check out what it’s like to fly on Emirates in Economy Class here. Author’s note: I paid for my own ticket for this flight. 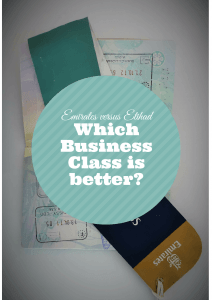 Emirates versus Etihad: which business class is better? Another great and honest review. 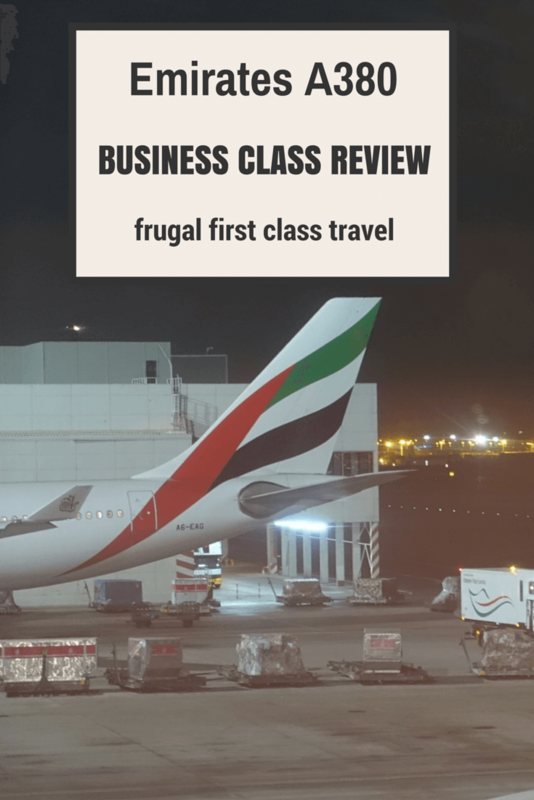 As you know I’ve tried and reviewed both First and Business on the Emirates A380. I did very much enjoy both and that shower feature is a great novelty. I suspect I’m a little more forgiving about the food but then again I accept it is airline food, it is never going to be exceptional. As for toilets, well I think unless you are First Class on any aircraft you’ll always risk a queue. Considering how many seats are in Business Class then 4 toilets are never enough on the A380. The lounge you feature is massive, probably the largest lounge I’ve ever been in. You did seem to catch it at a good time. If you are there around midnight then it can be absolutely chocker block with people. 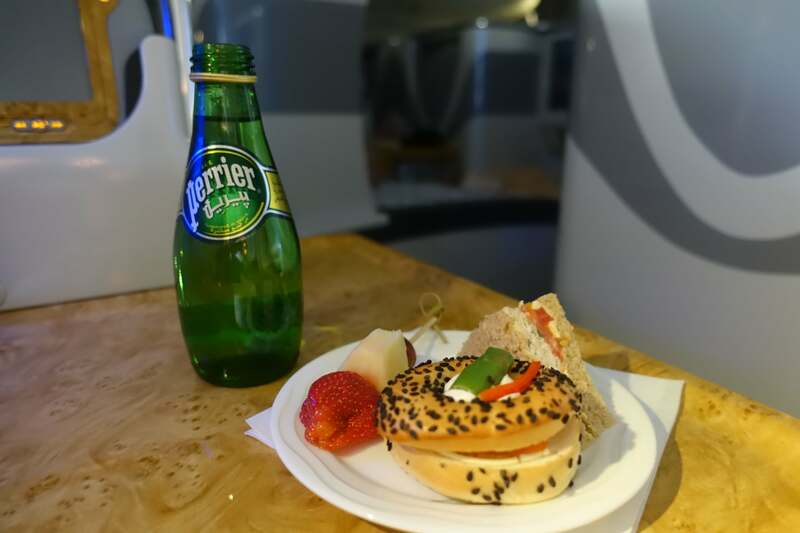 BTW I tried Air France La Premiere (First Class) at the weekend and it is exceptional compared to Emirates for the ground service at least. I’ll be publishing a review on my blog soon. Thanks Guy. I’ll be very interested in your Air France review. I always enjoy your business class reviews. They help with selecting a carrier for points redemptions. Thanks. 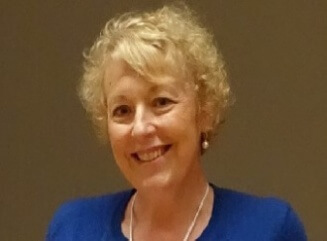 Thanks Dianne. Emirates is a good one, although unless you have access to the Qantas program, I think it’s harder to redeem points….. I dream of the day I can travel in business class like that! Unfortunately, my glory days were in the 1990s where the luxury factor was not in (but the service was great!). Loved reading all about it! I got upgraded to business class once. Although I wish I had the window seat rather than aisle for more privacy. But Emirates is one of the best flight from all the different 15 flights I have been in. It proves professionalism in its industry. What seat did you choose Jo? I honestly can’t remember exactly, but it was a window seat about a third of the way down the cabin. Fair review here. I flew Etihad Economy from Bangkok to NYC last week. Loved it. If their coach was that good I can imagine what their business class would be like. They even hooked us up with nice little ice creams as we descended on NYC; I’d not seen that in economy with any airlines. Thanks for sharing. A good point for Australian readers Bea, to make sure your Emirates booking is on an Emirates plane! 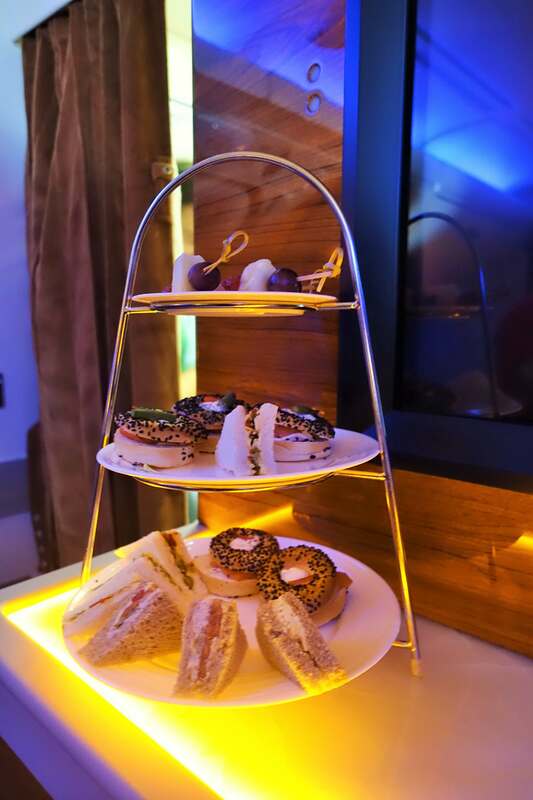 The thing I like most when flying with Emirates is the fantastic food and the friendly flight attendants. They are trained very well. Anyways, thanks for your post. They certainly are very well trained aren’t they?